Many individuals will create a living trust to ensure that an individual they trust has the ability to manage their finances if they are unable. If an individual does not have a living trust as part of his estate plan, or even if he does, a power of attorney is a critical part of estate planning. Creating a power of attorney allows you to select the person you want to take control of and manage your property and affairs in case you become incapacitated in the future. This is one of many reasons a power of attorney is used as part of a comprehensive estate plan. Even if your incapacity is only temporary, a power of attorney can still be very useful. The thing to remember is that designating your power of attorney as “durable” means that it will remain effective after your incapacity, where otherwise it would not. By creating a power of attorney, you have the opportunity to appoint the agent whom you have selected to operate as your agent. That person will have the authority to manage your affairs, as you specify. That means you can grant your agent the type of authority you choose, either limited or broad. In some states, a durable power of attorney can be set up to only become effective in the event of incapacity. Most often, a power of attorney is created to allow someone to control your health care decisions, your financial matters or both. If the power of attorney is limited in nature, then your chosen agent will only have the power to handle the specific matters you identify in the language of the power of attorney. There are many different goals that can be met with a power of attorney. 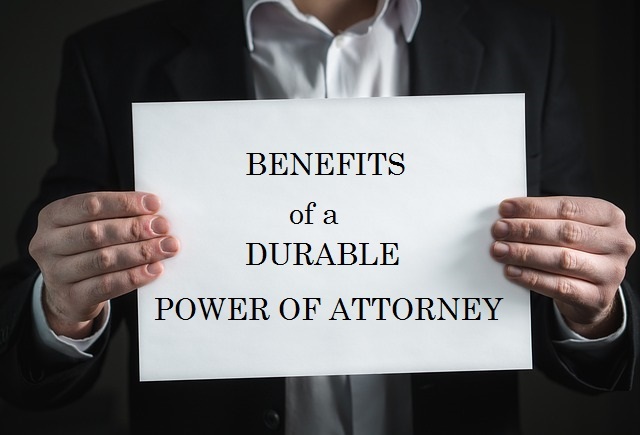 You can use a durable power of attorney in order to allow a business partner to have access to specific business assets for specific business- related reasons. You can also authorize someone to take over management of rental property temporarily, such as when you need to be out of the country for an extended period of time. Some people fail to recognize the real benefit of having the ability to select your agent now. What they tend to overlook is the fact that, if you have not chosen someone to be your agent, then when you become incapacitated a judge will make that choice on your behalf. As personal as your financial and health care issues are, it can be a great advantage being able to choose your own agent. There are a few things you can consider when you are deciding who to appoint as your agent with a power of attorney. Some factors to consider are the values and characteristics of your family and friends. That way, you can decide who would be better trusted to handle your personal affairs when the time comes. After you have established your durable power of attorney, your agent can begin making decisions on your behalf as soon as necessary. Another important advantage is that powers of attorney give you the opportunity to explain your expectations to your family and friends, and especially your agent, while you still can. This can be a very important advantage for most people. You have a greater chance of avoiding confusion and disputes among your family about how your personal matters should be managed. If you carefully draft your power of attorney document, then many of the disputes that would otherwise arise, can be avoided, such as how to handle your financial affairs or make your health care decisions. No one wants to see their family and friends disagreeing about how to handle their medical treatment or finances if they become incapacitated for some reason. If you already have someone lined up to become your agent you will be more likely to avoid those disputes in the future. In order to properly create a durable power of attorney, one that will meet your goals, you should seek the assistance of an estate planning attorney. If the right steps are taken, you can protect your assets while establishing the management of your financial and health care matters for the future. By using an estate planning attorney, you can consider including gifting provisions and other devices that can provide beneficial asset protection. Join us for a FREE seminar today! If you have questions regarding living trusts or any other estate planning needs, please contact The Potter Law Firm for a consultation, either online or by calling us at (704) 944-3245 (Charlotte, NC), (606) 324-5516 (Ashland, KY), or (859) 372-6655 (Florence, KY).